This 8 point buck was harvested the first day of deer gun season in Raccoon Township, and was the first white-tail for the hunter. OHIO VALLEY — Hunters in Meigs and Gallia had a succesful week for deer gun season. According to the Ohio Department of Natural Resources, Division of Wildlife, 2,642 were checked in from November 27 though December 3 in both counties. Gallia hunters harvest 1,318 deer, up from 1,211 in 2016. Meigs hunters harvest 1,323, down from 1,373 the previous year. In Gallia County, 994 hunters reported as harvesting one deer, 144 harvested two, and 11 hunters managed to harvest three in the one week season. 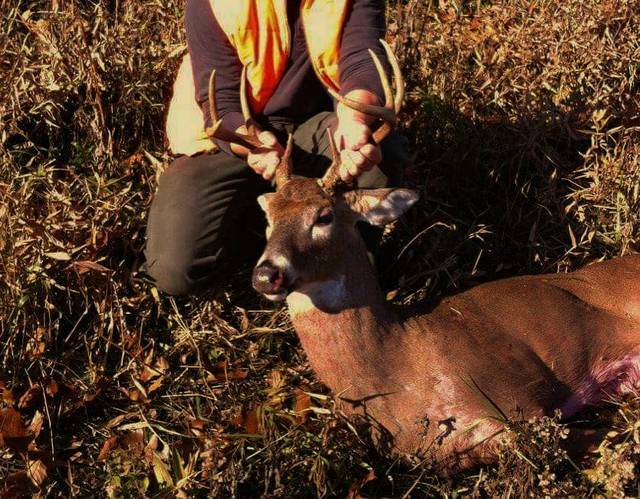 In Meigs County 1,061 harvested a single white-tail, 111 harvested two, and 11 harvested three deer. Across Ohio 72,814 deer were harvested, up significantly from 66,758 in the previous year in the week long gun season. According to local ODNR Wildlife Officer Roy Rucker, there has been a shift in recent years from large groups of hunters to individual hunters. This transistion shows that more hunters are opting for solo ventures in the woods, seeking to harvest white-tail by stealth whereas driving deer forces them to move into an area with other hunters. Hunters still have several opportunities to harvest white-tail deer. Archery season is open from September 30 through February 4, 2018, muzzleloader season runs from January 6-9 in 2018, and a second gun weekend on December 16-17. According to ODNR, white-tail deer hunting helps manage the population to minimize conflicts with landowners and motorists. Deer are known to affect farmers crops and a hazard to motorists on roadways. Hunting the deer population recreationally helps reduce these negative affects. Ohio also ranks eleventh nationally in number of jobs related with hunting; creating an $853 million economic impact according to ODNR. To learn more about hunting and trapping in Ohio visit wildohio.gov. Morgan McKinniss contributed to this article.